This article is a short summary of Mario Kart: Super Circuit. Mario Kart: Super Circuit (known as Mario Kart Advance in Japan) is the third installment in the Mario Kart series, released in 2001 for the Game Boy Advance. It is the only Mario Kart title to be developed by Intelligent Systems. 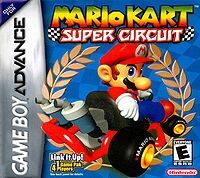 Mario Kart: Super Circuit is the fourth best selling game for the Game Boy Advance, selling 5.91 million copies worldwide, as of March 31, 2009. "It's on! Mario's back behind the wheel, tearing up the tracks in an insane new Mario Kart game for Game Boy Advance. Test your skills on over 40 tracks, either alone or with up to three friends. Don't drive safely, and watch out for flying Koopa Shells!" "All of your favorite kart-racing characters are back in Mario Kart: Super Circuit, and ready to kick it into high gear! Speed through 20 courses and hidden bonus tracks, each loaded with classic power-ups and primed for the free-for-all racing that only Mario Kart can deliver. Each character has their own unique racing skills--find your favorite, or master them all! Wield all of the best items from previous Mario Kart games, including Bananas, Red Shells, and the fearsome Spiked Shell! Burn rubber in the Grand Prix, race your own ghost, or shift gears for the mayhem of battle mode--the power's in the palm of your hand!" Basic gameplay is the same as that of other games in the series, in that players race on various tracks while using items to aid them in placing first. Up to eight racers can race at once. The game features five cups with four tracks each to start, with five more cups that can be unlocked. In addition to the racing mode, there is a battle mode, where competitors use items against each other in an attempt to pop the most of their rivals' balloons. Up to four players can race or battle using Game Link Cables to connect multiple Game Boy Advance systems. Mario Kart: Super Circuit 3DS (Virtual Console) 2011 A port of the game released exclusively as part of the ambassador program. JP/EU/AUS: 2015 A port of the game released as a digital download on the Nintendo eShop for Wii U, with added Virtual Console emulator features. This page was last edited on 6 April 2019, at 21:16.